Back in 2010 I enjoyed a northeastern-style buckwheat noodle restaurant in Huhhot, Inner Mongolia. 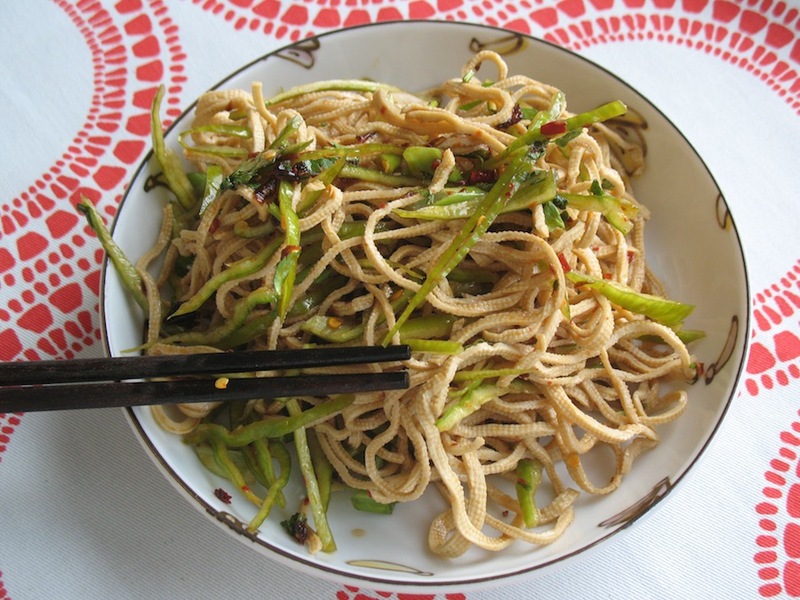 On the table were several cold plate dishes to eat together with the noodles, among them was a small dish of tofu threads or tofu “silk”. It was really nice, and new for me (most of my eating experiences in China had been other region’s foods). I really like the idea of having several cold dishes to eat along with one or two main dishes, like banchan at the Korean table. In addition to the cool nature of the dishes, especially during Philadelphia’s hot summers, the overall meals just seem healthier. 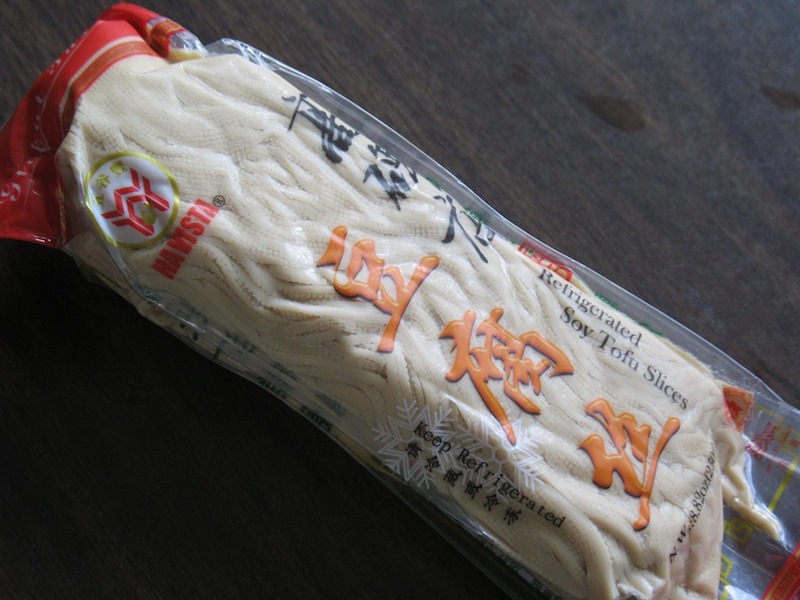 I found tofu threads in the refrigerated section of Spring Garden market. There was a variety of sizes. I bought this smaller bag for around $2. There are different kinds, some are infused with flavors. I accidentally bought this kind. This is the “5 spice” version. The spices are very mild, though, and it didn’t affect my recipe. It is actually a long sheet with tassels, rolled up. You can just cut the tassels off and use those, and you can make the head into matchsticks too if you don’t want to waste it. I made a very simple cold dish. I cut some chile pepper matchsticks, and mixed a simple sauce with a little black (Chinkiang) rice vinegar, some Sichuan pepper (huajiao 花椒) oil, a touch of salt, some green onions. Later I found I had some leftover chopped pickled beans from lunch, I added them too. Turned out nice (can’t really go wrong I think). 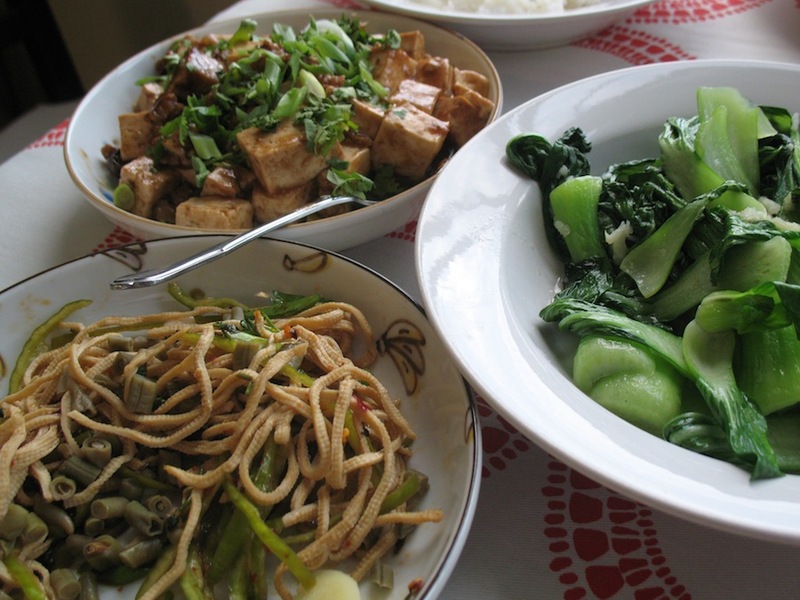 Other dishes on the table are mapo tofu, and fried baby bok choy. 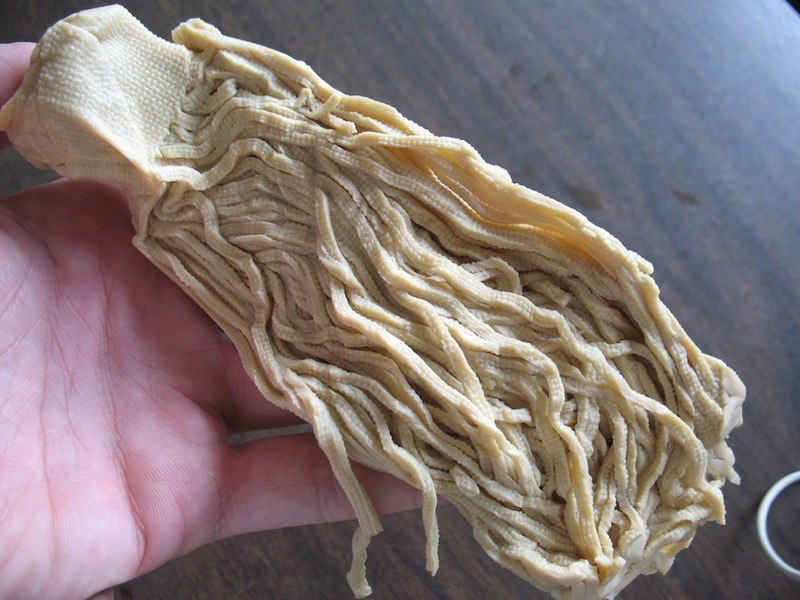 This entry was posted in - Featured Food Discoveries, - Recipes, Chinese food and tagged Chinese Markets, cold dish, 豆腐丝, tofu, 凉拌. Bookmark the permalink.